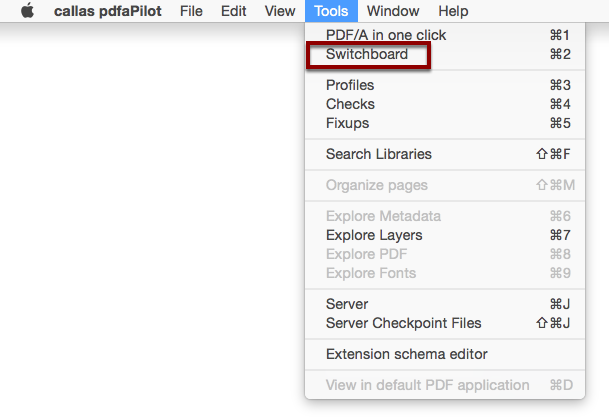 As well as the automatic Fixups applied by pdfaPilot when converting files to PDF/A, the software also offers a wide range of other actions for manipulating a PDF file. Many of these can be accessed via the Switchboard. 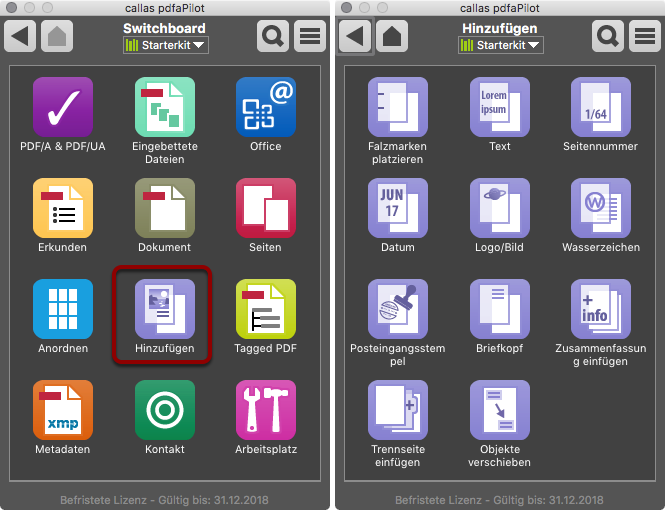 In pdfaPilot’s standalone edition, you can open the Switchboard via Tools > Switchboard in the menu or use the keyboard shortcut Cmd+2 (Windows: Ctrl+2). 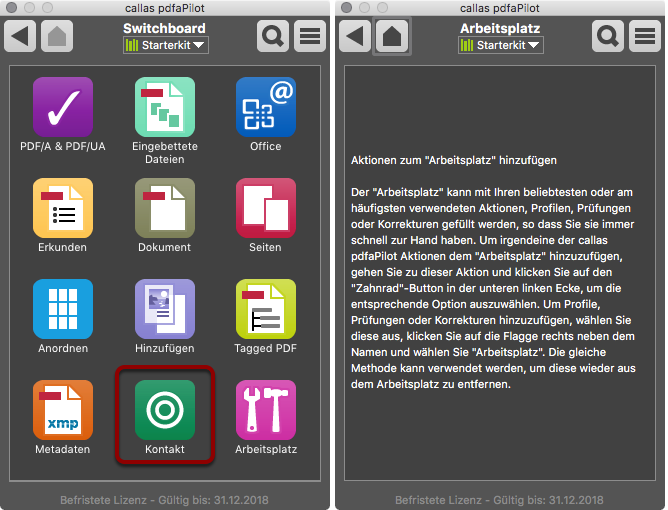 If you are using pdfaPilot as an Acrobat plug-in, open the switchboard via Plug-Ins > pdfaPilot <version number> Switchboard. 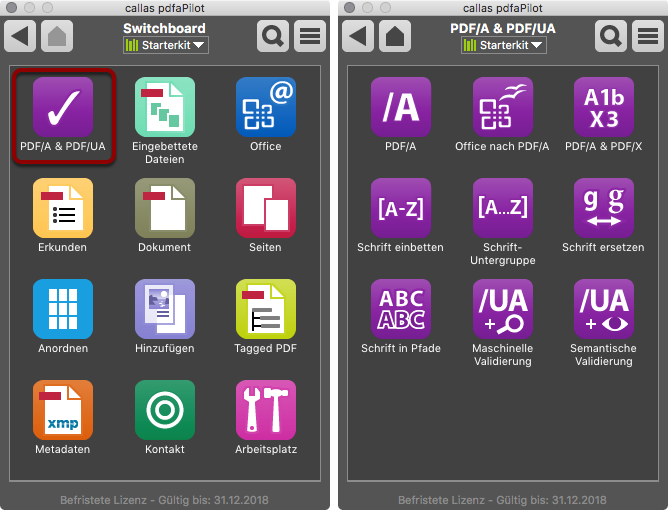 The pdfaPilot Switchboard window will be displayed. 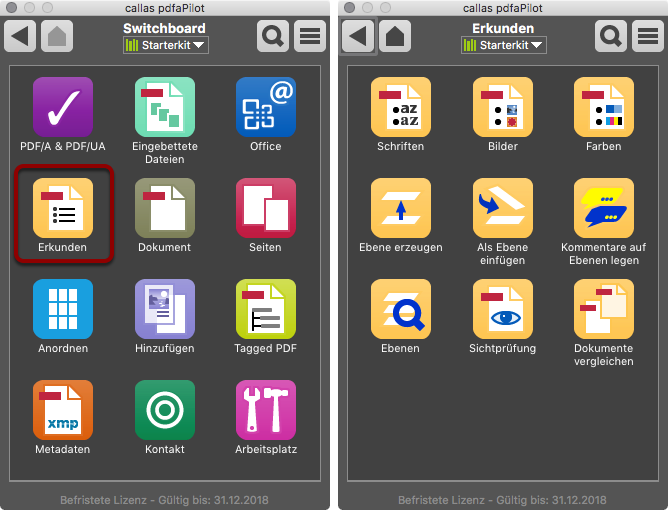 The Switchboard has a very simple, clear user interface, letting you get straight to work. The arrow button will always take you back to the previous section. The home symbol opens the main window. The magnifying glass opens the search tool for when you want to find a specific Action by name. 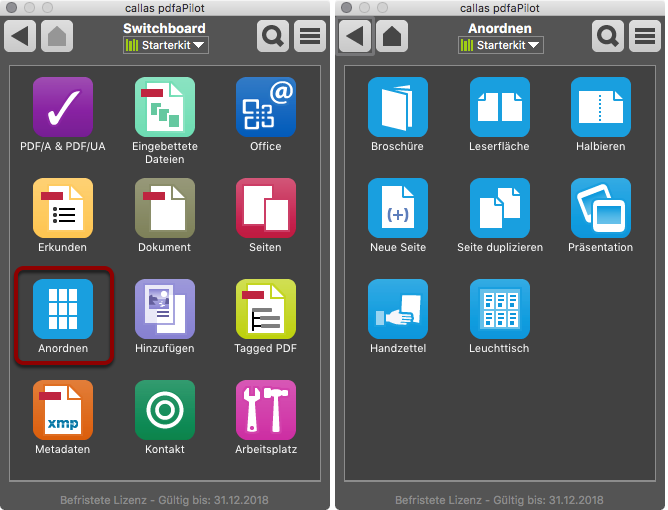 The button in the top right can be used to manage libraries. The main section contains the various groups for different types of tasks. The main window shows the various groups of Actions. Each group, in turn, contains a range of Actions. These can be accessed by clicking on the group's symbol. 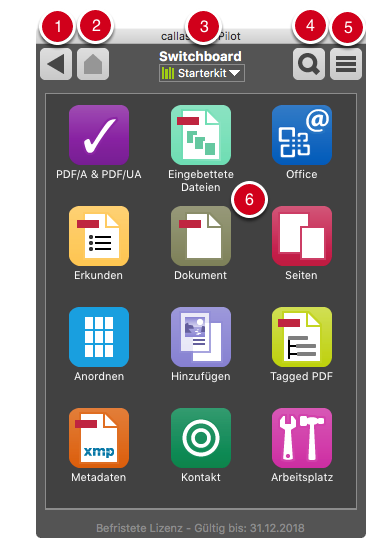 The Actions in this group are used to convert and optimize the PDF/A (long-term archiving) and PDF/UA (universally accessible PDF) standards. 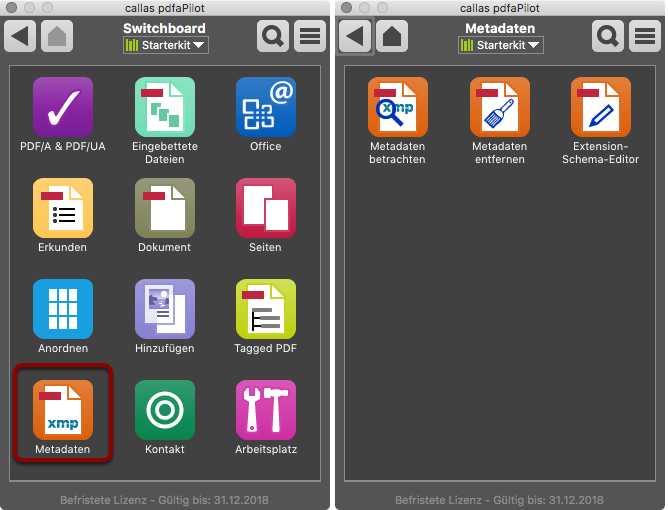 The Embedded files group offers a range of Actions for embedding and extracting files. 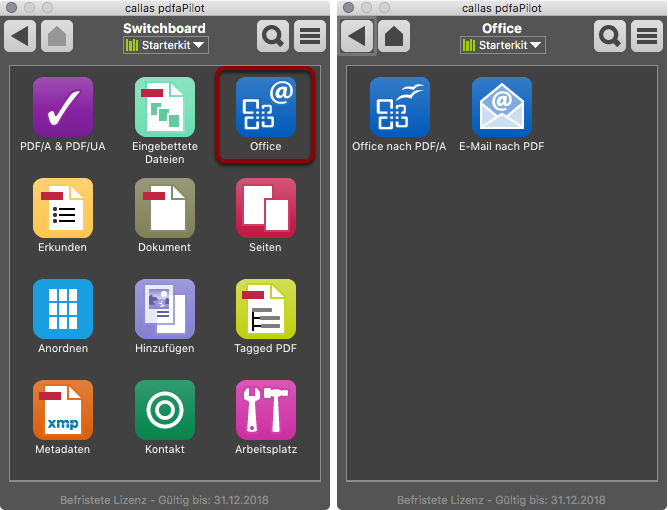 The actions in the Office group let you convert Office files and emails into PDF/A format. 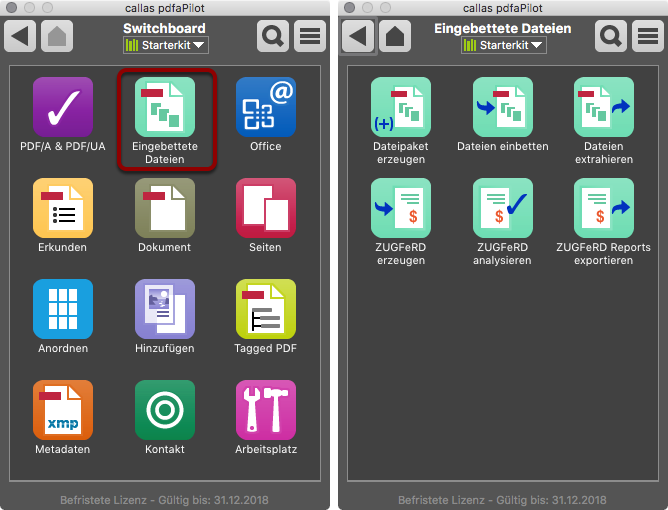 The Explore group provides a range of actions used to create different types of reports based on your files. Other actions involve layers and comments. 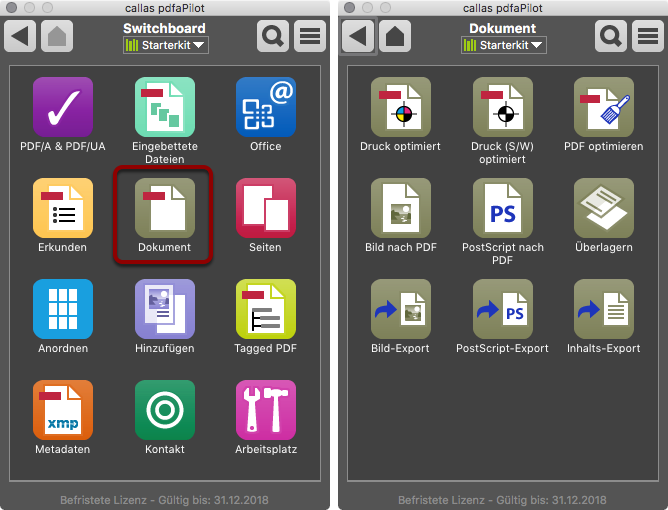 The Document group includes Actions used to change the properties of a document. The Pages group provides Actions used to change the page layout or order. The Arrange group contains Actions used for imposition. 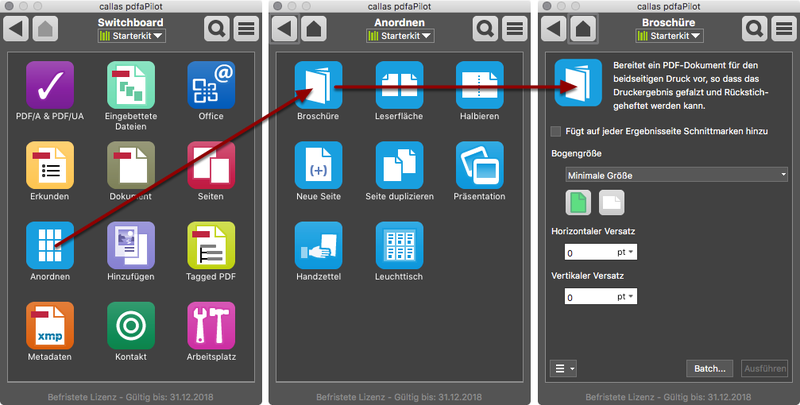 The Decorate group contains Actions used to add additional content to PDF files. 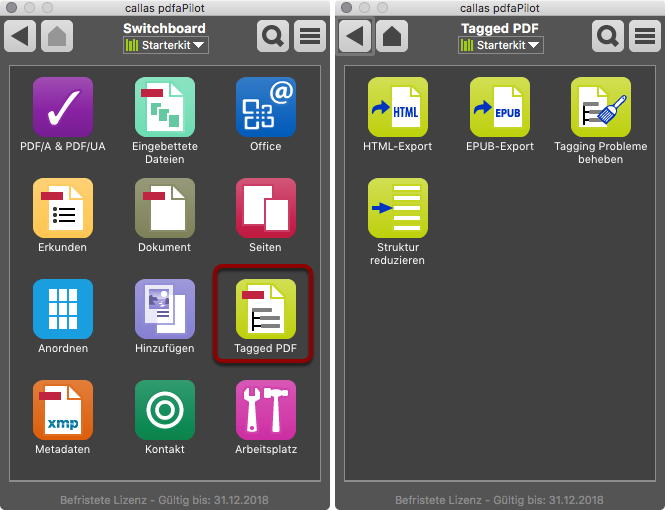 The Tagged PDF group provides Actions for exporting other file formats from structured PDFs or for optimizing structured PDFs. The Metadata group includes Actions used to work with XMP metadata. The Get in touch group provides Actions used to contact callas support, report bugs or suggest improvements. It also provides access to various tutorials. The Workspace group lets you collect your most frequently used Actions together in one place. 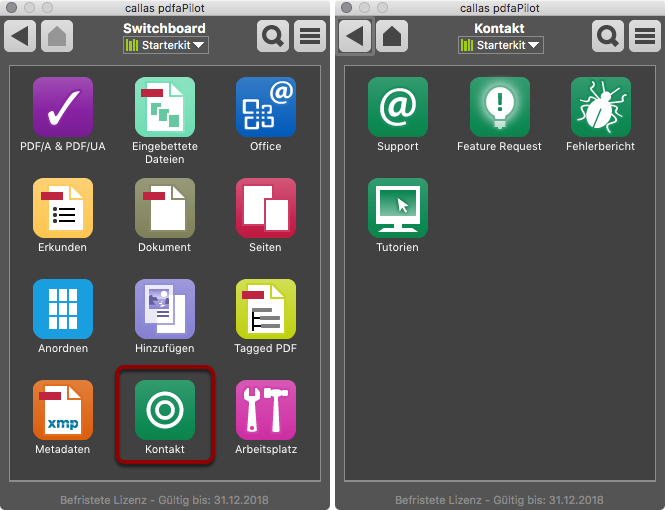 To add a Switchboard Action to the Workspace, click on the menu located in the bottom-left corner of the Action window. Click on an Action to open the relevant settings used to execute the Action. 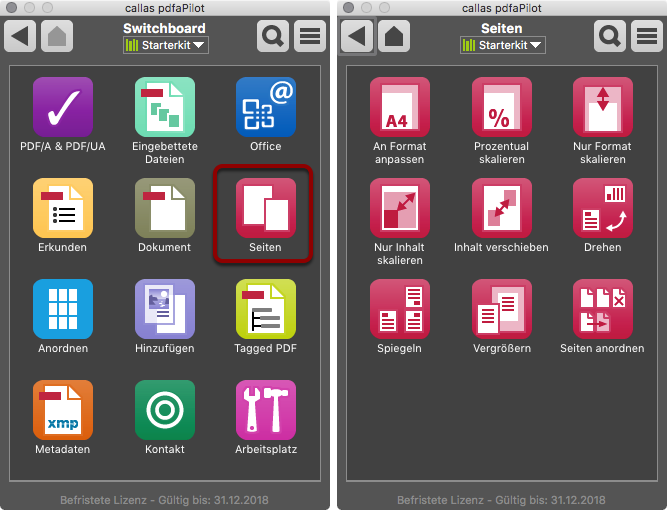 Example: In the Arrange group, you will find the Booklet Action, which you can use to turn a multi-page file into a booklet.